The Director of the Russia Institute at King’s College London looks back at the significance of Russia's 1917 revolution. "Failed utopias lead to the death of idealism, and the likes of Putin and Trump are symbols of this process". 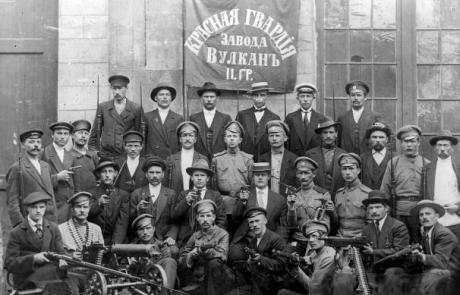 October 1917: Red guard unit at the Vulkan factory in Petrograd. Source: Public Domain. 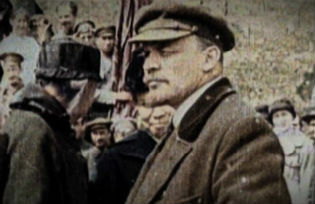 The Bolsheviks looked at western modernity and found it lacking – in need of transformation. However misbegotten, and without regard to its eventual mutations, the communist ideal – what Yuri Slezkine has described as a millenarian, utopian vision for the fall of Babylon and the establishment of Justice – was to its adherents a universalist idea. It was a pathway to universal justice, to global justice, and it emerged onto the scene just as its brother, the Wilsonian democratic ideal, strode forth from America. Both of these universalist projects shared a progenitor, in the Scottish Enlightenment of Hume, Ferguson and Smith. It has become commonplace to note how few conversations are happening in the Russian public space about 1917. The current masters of the Kremlin have hewn to a story of uninterrupted Russian power, from the princes of Kyiv, through Ivan the Terrible’s Muscovy and the Romanovs, into the Soviet era and beyond, with Putin the rightful heir of all of these disparate lineages. It is a neat trick, made possible only by the replacement of universalism with particularism. The only legitimating idea that connects the 19th, 20th and 21st-Century constructions of Russian power into a single arc is that of Russia itself. To a very great extent, the west as we know it was born in 1917 in Petrograd.